The brilliant blue linen, with its natural luster, is a lively option for the plattväv pattern floats. And blue linen weft for the hem makes a fitting border. These towels with blue accents have a different “character” than the towels with the black linen accents (as seen in Striped Warp Freedom). The accent color makes a big difference. Golden bleached 16/1 linen for plain weave weft. Plattväv pattern weft is doubled royal blue 16/1 linen. 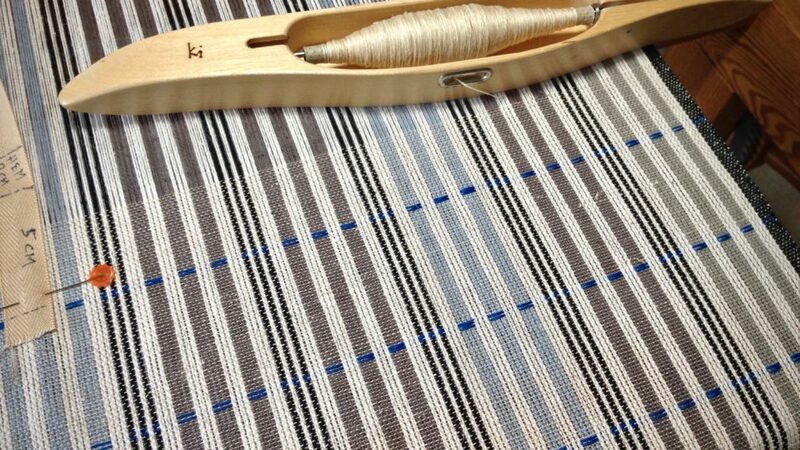 I planned stripes in the warp to simplify the weaving. 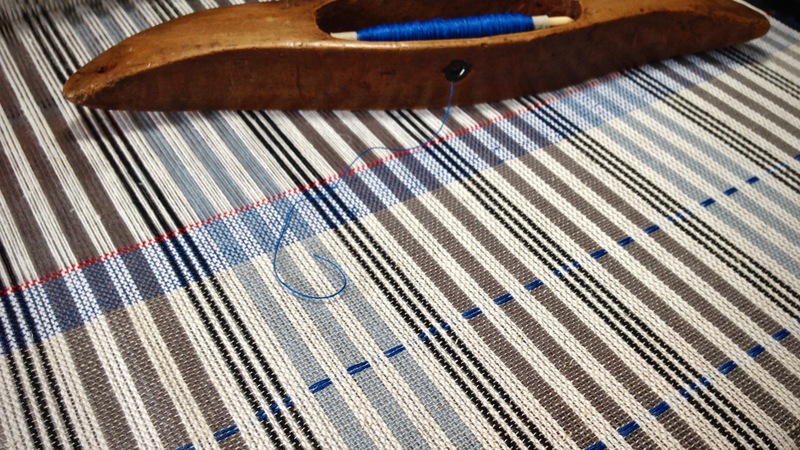 The warp stripes enable me to weave patterned towels with a single weft color. Plattväv weft floats keep it interesting. As much as I like blue linen, I am uncertain about it here. I’m waiting to see the towels off the loom, washed and dried. In the meantime, the warp stripes make my heart sing. And I’m thankful to have options for the pattern weft. Royal blue 16/1 linen is used to weave the hem. The antique Swedish shuttle seems appropriate for this Swedish weave. We always have a reason to sing. ThanksGiving may be a holiday, but it’s also a way of life. It’s seeing the good, the benefits, the blessings, even in the midst of uncertainty. It’s knowing that carefully planned warp stripes are still there. My hope is in God. My soul is confident, firm, and steadfast in him. And thankful to the core. May your heart find a song to sing. Hi Lynn, I often write about things that are reminders to myself. This is one of those.